With Windows 10, Microsoft stole Canonical’s thunder. Canonical had been pursuing the dream of “convergence”— a phone that can power a PC desktop—for years. This year, Microsoft declared plans to bring a similar feature to Windows 10 as “ Continuum,” making it a central part of Windows Phone’s identity. This lit a fire under Ubuntu, and Canonical’s Mark Shuttleworth announced hardware would ship before the end of 2015 and beat Windows 10 to market. That Ubuntu phone has now been delayed. Canonical hasn’t made a peep about the device since Shuttleworth’s announcement, and hasn’t even announced which manufacturer would be creating it. In a little-noticed video spotted by Phoronix at the end of September, Canonical’s Pat McGowan said there wasn’t anything more to say about the device but to wait for it “next year.” It looks like the device has been pushed back into 2016. This isn’t really a surprise. Unity 8 and Mir have been making progress but still aren’t ready to power a desktop. The next Ubuntu long-term-service release—16.04 LTS—will be released in April 2016, and even it won’t feature Unity 8 on Mir for most users. That will be a separate disc image and typical Ubuntu users will be encouraged to keep using Unity 7 on the standard Xorg system. Canonical’s deadlines continue to slip. 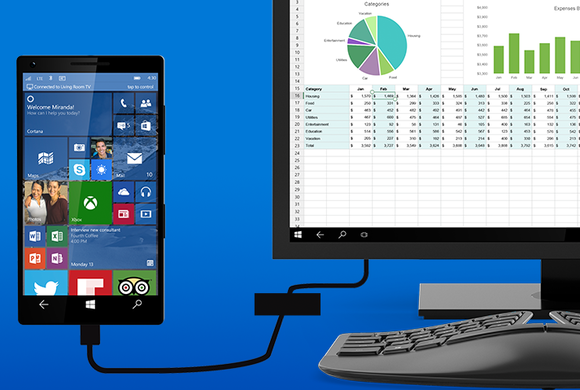 A Lumia Windows 10 Phone can mime a Windows 10 PC when connected to an external monitor. Despite its own delays, Microsoft continues to work hard on Windows 10 Mobile. In fact, Microsoft just released a new insider build of Windows 10 for phones. It’s taking Microsoft quite a while to finish—the desktop version of Windows 10 has been out for months, after all, and they’re supposed to be the same core operating system. But Microsoft is getting there faster than Canonical. Microsoft recently announced the Lumia 950 and 950 XL, flagship Windows 10 phones that will feature support for Continuum to power a PC desktop. Other manufacturers, like Acer, have announced “PC phones” with Windows 10. Windows Phone will be the first big converged platform. On its official Facebook page, Microsoft’s Lumia account revealed Windows 10 will roll out to existing phones in December. That means Microsoft wins the race. Of course, it’s not actually a race, and there can be more than one winner. Competition is good, and an open-source solution powered by Linux would be great to have. Canonical is running a real risk that interested potential users will stop caring as the years drag on without a big hardware release, however. But hey! There’s always Plasma Mobile.